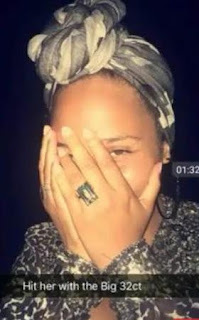 Home / ENTERTAINMENT / Alicia Keys shows off huge 32 carat diamond ring as she celebrates 6th wedding anniversary with Swizz Beatz (photo). Alicia Keys shows off huge 32 carat diamond ring as she celebrates 6th wedding anniversary with Swizz Beatz (photo). Singer Alicia Keys took to snapchat to show off the huge 32 carat diamond ring she got from her husband and record producer Swizz Beatz as they both celebrate their 6th wedding anniversary.